Gang Beasts was first announced well over three years ago. In fact, it was more than three years ago that it first entered an early access state on PC, and it’s been quietly simmering ever since. Excitement for the physics brawler ran high. What could be more fun that smashing a bunch of physically unstable and jello-like avatars into each other, trying to knock your opponents into the abyss? 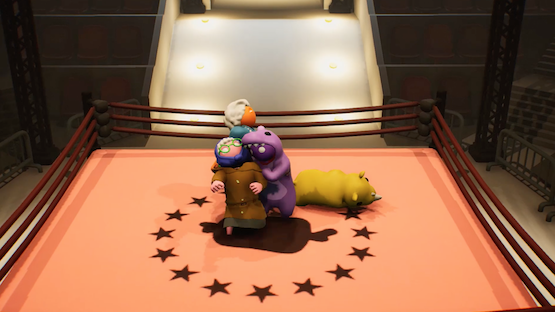 Finally out officially for the PlayStation 4 as of last week, Gang Beasts still feels like a game that’s in early access, even if there’s a whole unpolished pile of potential somewhere beneath its quivering mass. I’m going to get this out of the way. Yes, I know that the sloppy controls are basically the entire point of this “jelly brawler.” I’m aware that the strange physics and imprecise punch fests are part of the charm. I’m keenly cognizant that it’s not a matter of skill, and that Gang Beasts is intended to be a hilarious party game. But I didn’t expect absolutely zero hand-holding when I first went in. The menu is bare bones and lacks any kind of flair or pizzazz at all, and there’s no tutorial to be found anywhere. There isn’t even a basic “here’s what button does what” thing. I had to dig into the options menu to see the input layout and try to make sense of the controls. Good luck pulling off a stunt as coordinated as this! In many other games, that would be fine. Tapping a few buttons would be enough to visually figure out what they do and how to play once you’re actively playing, but Gang Beasts’ controls are so imprecise and jelly-like that it’s impossible to tell what any button presses are actually doing. Even knowing things like “circle is headbutt” and “square is kick,” I’m still not exactly sure what functions those have in the game in terms of helping me win these bizarre brawls. I still get creamed by other players and tossed over the edge onto roads, into fires, and crushed between grinders. Here’s the kicker; I know it’s not impossible to have some sort of tact and precision in Gang Beasts. I’ve seen some other players online that can do some crazy things, like climbing back from a near-death moment and easily concussing other players to pick them up and toss them over an edge, but my own controls seem to be entirely random and unresponsive. I know that in effect, I’m just bad at the game, but how can I ever be given a chance to get good if the game’s control curve is a sheer cliff for newcomers? In that respect, Gang Beasts can never be a good pick-up and play type of game, because it will constantly defeat new players. The controls could stand to be just a bit more predictable, not to mention having an actual tutorial section that teaches me why I’d even want to use certain moves, and how to combine them for cool moves instead of button mashing and hoping for the best. It could still have the crazy physics, but at least I would know why I was losing or not being effective. The lack of any kind of new player guidance—along with the painfully simplistic menus—is just a window into how unfinished the game feels , despite having been in early access for so long. 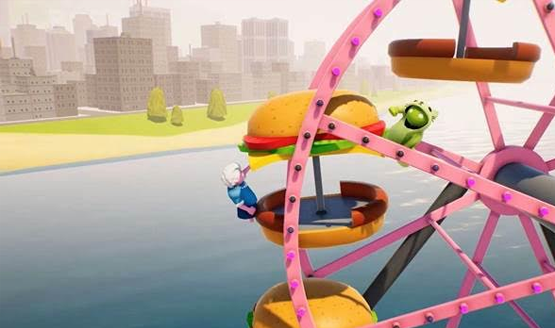 Despite a variety of levels, Gang Beasts’ physics gimmick runs out all too soon. In terms of content, Gang Beasts runs dry pretty quickly. It’s entirely based on the physics brawling, so whether that’s in every man for himself, in teams, or against waves of AI opponents, there’s not a lot to do once you’ve played a couple of matches, even if there’s a nice variety of levels in which to smash jelly bodies into each other. Soccer is an interesting distraction for exactly one match, but again, wore thin when I realized there wasn’t an ounce of skill involved, it was button mashing, grabbing, and ramming into each other until the ball rolled off into one goal or the other. Therein lies my issue with Gang Beasts. I can sense a pervasively interesting game, but the state that it’s in right now feels less like something that’s been refined for more than three years, and more like a quickly cobbled together project that never got the polish that it’s in need of. The menus, the score screens, and the lack of any kind of player guidance all bemoan a game that’s still being made, not one that’s finished and asks paying customers for their hard earned money. And that doesn’t account for the rash of connection issues that meant it was a full week before I could even play Gang Beasts, and even then it was a chore just to get and stay connected to a game. Again, after years in early access, I would expect that the online connections would be far more stable. Often I am met with an error screen from the outset, never even allowed to connect to a lobby. When I was finally able to get in, I frequently found myself kicked from the game for a variety of reasons. Once I get into the game, I watch as it goes from a full lobby to players dropping round after round, until finally I get kicked for not having enough players to proceed. Sure, the online issues might be fixed in the future, but for now, it’s not worth fighting with them just to get into a game where I have to fight with controls that I don’t even full understand. This grabby, huggy mass ends up being 80% of each match. I like the idea of Gang Beasts on paper. Hell, I even like Gang Beasts when I see other players play. The jelly physics of up to eight players smashing into one another and trying to toss each other over the edge is great fun in theory, but becomes more of a frustrating chore and test of patience in practice. If there was a better training ground to at least get a handle on the bizarre physics and controls, that would go a long way to making the game more accessible to newcomers. 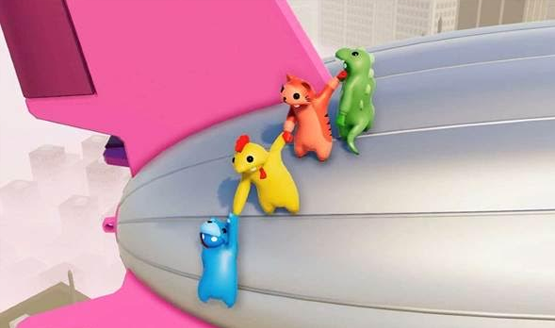 Even if they had that, Boneloaf needs to get a handle on their connection issues before Gang Beasts can really start to step into its stride and potential as a hilarious party game. Gang Beasts review code provided by publisher. Version 1.02 reviewed on Standard PS4. For more information on scoring, please read our Review Policy.